Sketch. Affinity Designer. XD. Figma. Pixelmator Pro. InVision Studio. All fresh, new products developed in recent years to break down the long-lost monopoly of Adobe Illustrator since the Julius Caesar-like demise of Freehand (RIP). Vector artwork can initially seem like a simple idea. Just draw straight lines and curves, give them a fill and border colour, scale up and down at full quality with a look of distinct smugness. Pity those pushing pixels in Photoshop. Repeat. Unfortunately history is showing that it’s not quite as simple as that. 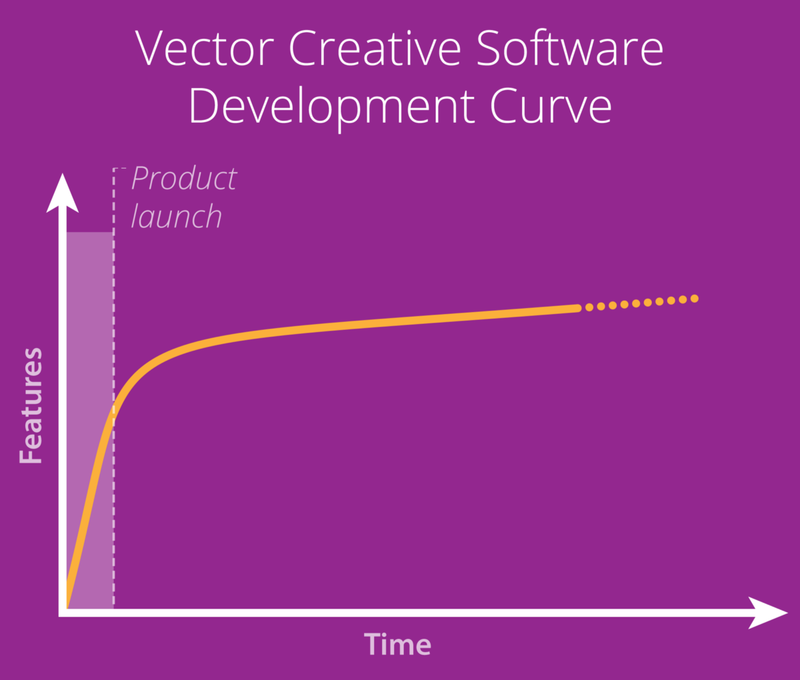 You see, getting basic vector shapes to appear is one thing, but making them dance to the designer’s tune with intuitive tools based on thoroughly developed underlying vector handling technology is a completely different level. The partial reason that so many tools have appeared in recent times is that the toolkits for macOS, iOS, Windows, Android, web frameworks, etc. give entry-level vector functionality out of the box. This allows developers to take advantage of vector rendering, Bézier path creation and more in a near-instant. There are exceptions with some developers creating their own renderers, software chassis and vector control from the ground-up just as Adobe was forced to with Illustrator some 30 years ago. And Corel, around the same time. Imagine yourself as a developer. You have made a very robust plan to create a new vector creative package that you hope will be taken seriously by designers, UI/UX creatives, packaging, animators, and a whole wealth of over vertical markets you identified. Your team has not seen daylight for years getting bootstrap funding to stretch whilst basic Pen Tool clones (all the exploratory research in Starbucks has indicated a 30 years old paradigm should be maintained… memory muscle and all that) have been carved out of code. The home-brew vector renderer allows your rounded rectangle to be viewed from the equivalent of outer space or with the detail of an electron microscope. Not only that, but you’ve added a little bit of magic in a tool that nobody asked for as it is such genius, how could anybody else possibly have conjured up such startling innovation? In the third year, your hired gun web team push The Message to The Waiting Crowd. There are rapturous ripples of thumbs-up emoji to sponsored social media posts and this-will-be-a-game-changer comments from all. Approximately three weeks later, after the adoring masses have prodded the first release for a second time in a coffee break, users will then start to ask the inevitable. “It could be useful, but I can’t possibly replace [insert established software of your choice] as it doesn’t yet have [tool of your choosing]”. The trouble is that what the user wants is technically a little challenging. It requires math that looks like it could work after a couple of months, but there seem to be more “edge cases” than first expected. So that small addition quickly morphs into a major undertaking that could take a relatively unknown amount of time to put in place. And when released, it won’t be truly valued as it would only be a feature “that should have been present from day one”. Think along the lines of drawing parallel (offset) paths, uniting (pathfinding) 300 fiddly tiny shapes, or even reshaping a path naturally and without the result of resembling a drive-by shooting of vector points. Suddenly, the speed of development outwardly apparent to users starts to look like that shown here. Let’s snap out of this nightmare scenario of being a developer. It’s starting to quickly look like the automotive market where each and every year, tens of bright young hopeful companies make an announcement that they are the ones who will smash the monopoly of Ferrari and the Volkswagen empire in the Western hemisphere. Out of the past 20 years, only two or three such companies have succeeded in surviving by being very niche or being bloody-minded and hugely backed. The reality of developing the details to a high level of polish is tougher than ever could be wishfully ignored. And this all requires a near-limitless supply of cash. So come on… why is CorelDRAW important? Simple. It’s had 30 years to refine their design chassis and stack of tools. They never disappeared in that time, even though Corel was dead to Apple aficionados for the majority of those years. However, by embracing the massive creative customer-base who are stuck limpet-like to macOS, they have removed the largest and most relevant argument to bypass the Corel brand in one fell swoop. CorelDRAW Graphics Suite has time-saving tools that other graphics software either don’t have, or require a plugin for. …also holds true. And yes — Astute Graphics did get that hint loud and clear. You only have to look at CorelDRAW’s native mirroring functionality to realise how much it… erm… reflects MirrorMe. There’s nothing wrong with that as competition is good and at least tens of thousands of Illustrator users have Astute Graphics to lean on to ensure they can reclaim workflow improvements and time savings. CorelDRAW is around 4x more mature than Affinity Designer. It blows Sketch out of the water for feature completeness and UI refinement. It reaches out to a wide range of users way beyond what XD, Figma and InVision can hope for. It is Adobe Illustrator’s greatest competitor for the widest range of potential users. Plus, it’s available beyond a subscription model. In the UK, their suite is a one-off £599.99. Let’s not squabble and call it a round £600. And that’s why it’s also likely to fail. For all the hatred of the subscription model when Adobe announced the move to Creative Cloud, it’s simply too hard to argue against its initial month’s payment of £50 for more creative apps than you could ever expand your workflow to. If you’re a hard-up designer just starting out, finding £600 is probably a stretch too far. The other concern with perpetual licensing (Affinity and Sketch — this applies to you too) is funding an ever-growing demand for complex and investment-heavy new features. Somehow they have to be paid for, so if not by subscription, then by repeat one-off payments. Not everybody likes that large, inevitable cost dropping by either. Thank you for sharing your thoughts about the v1 product with 30 years of development the team at Corel just released! Just one point of clarification: CorelDRAW Graphics Suite for Mac is available both as a perpetual license or as a subscription. We at Corel want to provide our customers the choice to license the software the way they want (perpetual vs subscription) and don’t force anyone to go one way or another. And this is not new, we’ve been doing it this way (for the Windows version) since the summer of 2012. Indeed! I stand very much corrected. That was lazy research on my part. CorelDRAW is available for £16.67 monthly along with other subscription options in the UK. I’d be the first to say this is good value and worth investigating. Even though not like-for-like as the CorelDRAW suite is a collection of applications including Corel PHOTO-PAINT and access to the CorelDRAW.app (as yet un-tested personally, but interesting none-the-less), it’s comparible in cost of subscribing to Adobe Illustrator alone at £19.97 monthly. It is healthy to have to look over your shoulder regularly to see how well you’re doing to survive the race. If nobody chases you, you will become lazy. Witness the transformative kick on development rates for Adobe with its XD offering. It’s doubtful this amazing pace in development would have come about if it wasn’t for the emergence of Sketch, Figma and InVision. Possibly, the largest threat to Adobe Illustrator’s dominance will therefore come from an unlikely source; it’s oldest foe. This could be the best news for Illustrator users in many years as the development pencils in Noida are likely to get a quick sharpen. What about the others wannabes? Can they ever catch up after so many years of development? Well, XD has taken the very wise route of heavily pushing — and working closely with — third parties such as Astute Graphics to develop and deploy plugins to fill immediately obvious gaps. Naturally, the XD team having a multi-billion Dollar organisation with an established reach into every design market to bankroll them, has its advantages too. For us, and we’re sure for the wider market, the most exciting potential ensuring the highest rate of creative tool development is that Astute Graphics is actively working with a variety of developers. This will ensure the Astui service and AG Tech can contribute to the accelerated pace at which advanced vector tools can be delivered. Why? Because competition is good. Let’s all watch this space… we’re in exciting times! Nicholas van der Walle is the founder of Astute Graphics, developer of plugins for Adobe Illustrator since 2006.